As graduate students, Dr. Milos Savic and Dr. Dave Hren began writing an Abstract Algebra textbook while studying together at New Mexico State University. Before finishing the textbook, the two parted ways pursuing their respective careers. Dr. Savic is now a Math faculty member here at OU and Dr. Hren has a career in industry out of state. The two have always wanted to finish their book but were never quite able to work out the logistics of meeting to finish it. 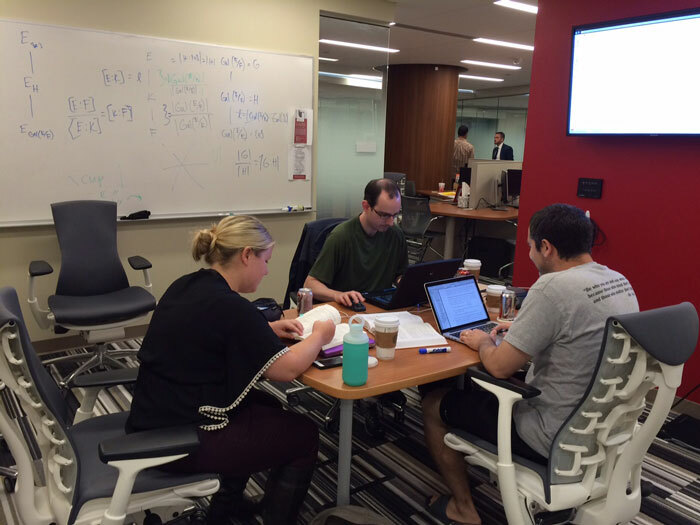 When Dr. Savic learned of the Open Textbook Initiative and the yearly grants offered by it, he submitted an application for funding to finish the Abstract Algebra textbook. Dr. Savic used his grant to purchase airfare and lodging for his colleague, Dr. Hren to spend a week here at OU to finish the project they started together. Also with his award, Dr. Savic is funding a graduate teaching assistant, Molly Stubblefield to assist the two in finishing their book. Molly will also help lead students in another sprint later this summer to write ancillary materials to support the textbook. The two had always planned on openly publishing their book and the Open Textbook Initiative offered them an opportunity to finish their project as well as eliminate textbooks costs for Dr. Savic’s Abstract Algebra class. 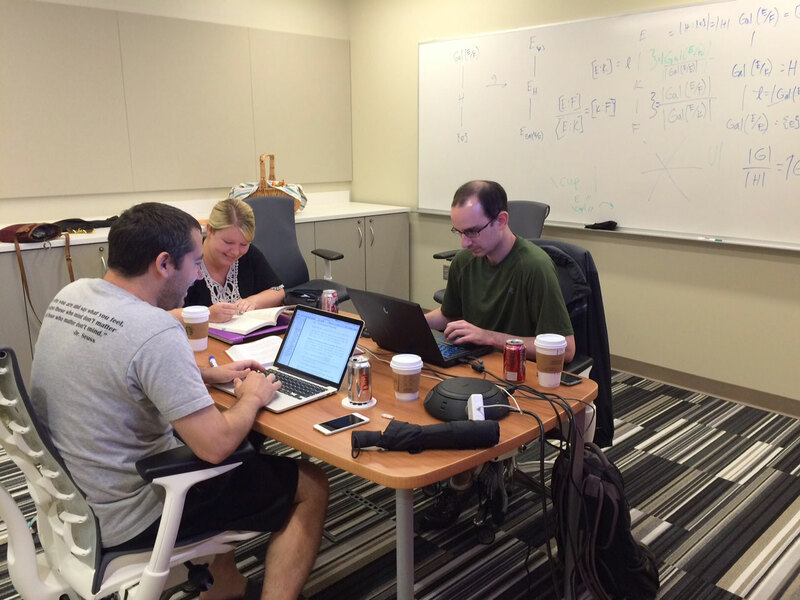 Dr. Savic, Dr. Hren, and Molly spent a week camped out in the Digital Scholarship Lab working on their book. When finished, the plan is to publish the book and its ancillary materials online. A PDF copy will also be available for download for those who would like to have an offline copy. Stacy and I interrupted the team a few times during the week to offer support and cheers of encouragement and to also snap a couple pictures. We’re glad that the Open Textbook grant has allowed this team to come together to create a resource that will provide Dr. Savic’s students a free textbook, but will also hopefully be adopted by other faculty members to serve students here at OU and elsewhere.